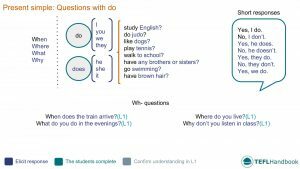 A collection of resources for teaching present simple 'questions with do' to elementary level students (A2). It includes a suggested lead-in activity, along with practical ESL activities and games that are suited for low-resource ESL classrooms. 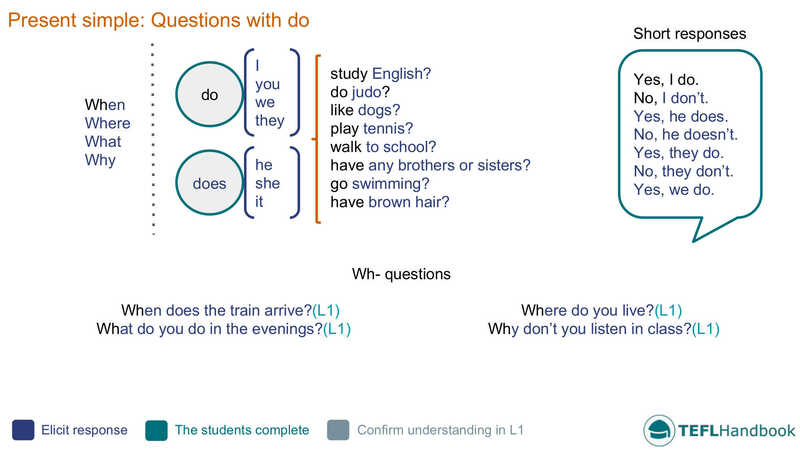 The sample board work assumes some prior knowledge of the present simple tense. You should try to elicit as much as possible, using the colour-coded text as a guide. If you need to bring these materials into the classroom for reference, the TEFL Handbook app gives you offline access to all of the ESL resources on this site, plus a lot more. 1. John / live / Spain? - Does John live in Spain? 2. Clare / French? - Is John Spanish? 3. Where / you / live? 4. What / her / name? 5. she / like / maths? 6. When / she / have piano practice? 7. you / get up at half past eight? 8. Why / they / walk to school? 9. Where / we / going? Get up? / Go to bed? When they have finished writing, students will interview each other in pairs. Teacher: What was the first question you asked? Student A: Where do you live? Teacher: Where does he live? Student A: He lives in Madrid. Here is one idea for a fun ESL classroom game for practising present simple questions. As usual, our games require the minimum of classroom resources and materials (whiteboard and markers). Student A: Are you a man? Student B: Yes, I am? Student C: Are you an athlete? Student B: No, I'm not. When it comes to ESL lesson planning, teachers can always do with more ideas. Here are some choice materials from around the web. If you're looking for additional ESL activity and game ideas, check out this collection by teach-this. You'll have to become a member to get full access, but there's still plenty of useful ideas there for free. For adult students who are looking for conversation practice, this list of ESL conversations at eslconversationquestions will serve as good practice for asking questions using the present simple. If you're looking for worksheets, islcollective have a comprehensive collection. We recommend the present simple questions worksheet. Finally, this video from Mark Kulek on the use of the verb do as an auxiliary verb for questions is a useful addition to your lesson. If you've found these ideas useful, have a look our complete list of ESL lesson plans for elementary level students, A2 lower and A2 upper. For other levels, see our entire collection of ESL lesson plans. Our suggested next lesson is on subject and object pronouns. Are you an Android or iOS user? Then you should give our app a go! The TEFL Handbook app has over 100 lesson plans, 300+ ESL activities and over 100 ideas for classroom games. All of which can be accessed offline, perfect for quick reference in the classroom.